Its heeeeeerrrree! For at least two (three at a push) weeks, Summer has arrived. Summer is a fleeting season in Scotland, you gotta enjoy it as and when it arrives. Even the seasonal produce (asparagus, rhubarb, strawberries) is blink and you miss it. So if that means BBQ’ing at 3pm on a Tuesday in the middle of your working day or throwing together a last minute Pavlova, you do it. No faffing about. 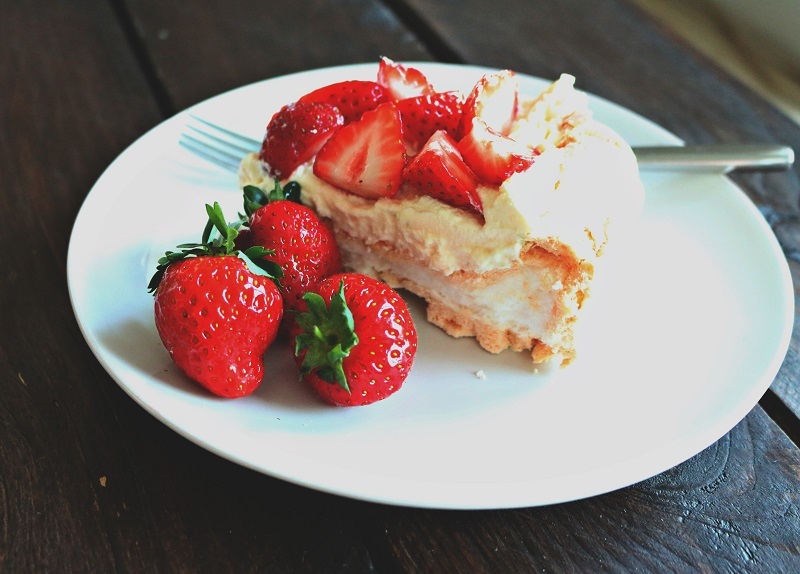 To me, a strawberry pavlova IS the taste of summer. Throw in a jug of Pimms (click here for my quintessential British recipe) and a few M&S bangers on a disposable BBQ and you pretty much have British summertime dining in a nutshell. This is what I like to call a moderately sized pavlova in that it will serve 4 greedy portions. So if I make it mid-afternoon, I can guarantee it will be gone by bedtime. Which is what you want with a Pav, it doesn’t lend itself to sitting around overnight, you lose the crunchy base. However, you can make the base a day in advance and add the cream and strawberries when you’re about to serve. You can also increase the quantities in times of need or greed. Just remember the Pavlova Rule = 1 egg white + 50g sugar. So to do a 6-egg pavlova (and feed more people) you need 300g sugar. 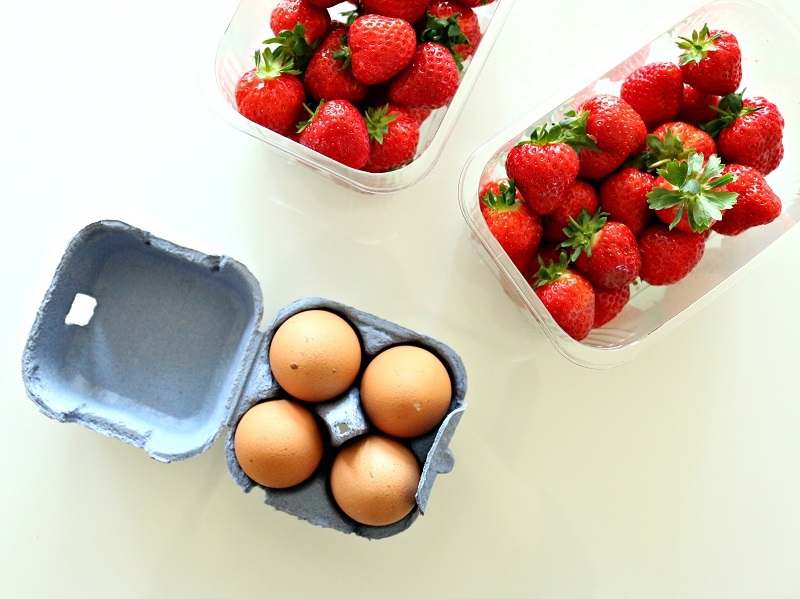 Try to use the freshest eggs you can get your hands on and ensure the strawberries are at room temperature before serving. Cut a sheet of greaseproof paper to fit a baking sheet. 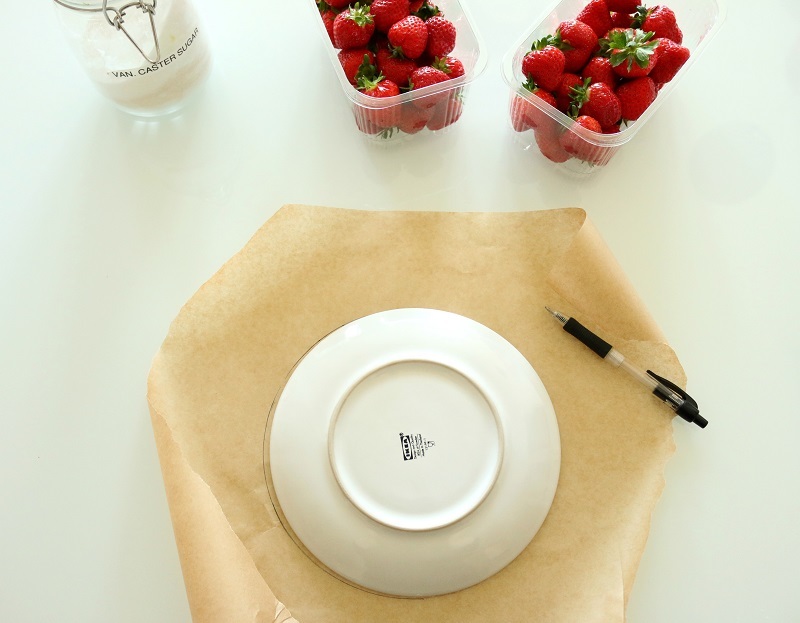 Lay a side-plate onto the paper and draw around it with a pen/pencil. Set aside until ready to use. Rub half a lemon around the inside of the mixing bowl that you’ll be beating the egg whites in. This will remove any grease and ensure the egg whites fluff up. 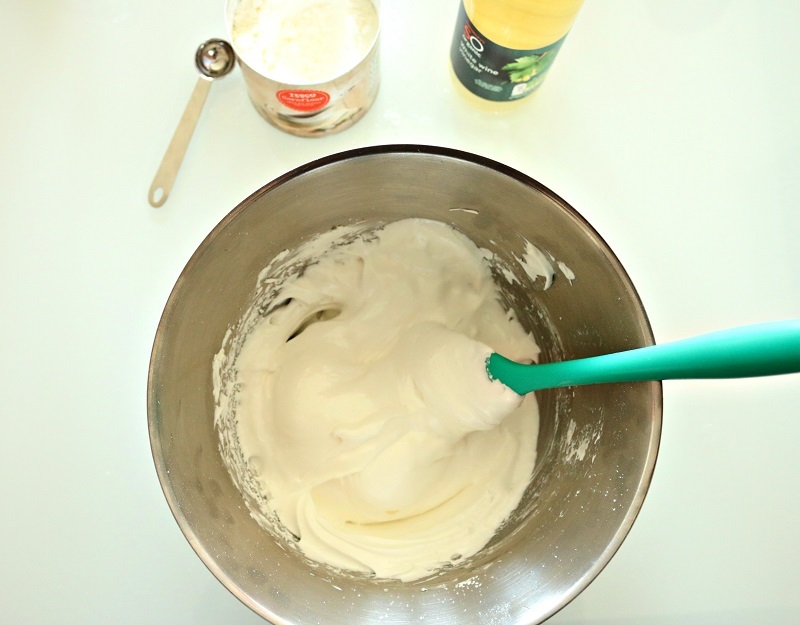 Separate the eggs and beat the egg whites using an electric whisk until light and fluffy. Then add the pre-measured sugar to the egg whites 2tbsp at a time. Once all the sugar has been added, continue to beat the egg whites until stiff peaks form and the mixtures becomes glossy. You can check the eggs are ready by rubbing a small amount between finger & thumb: if it feels grainy, continue mixing. If not, you’re done. 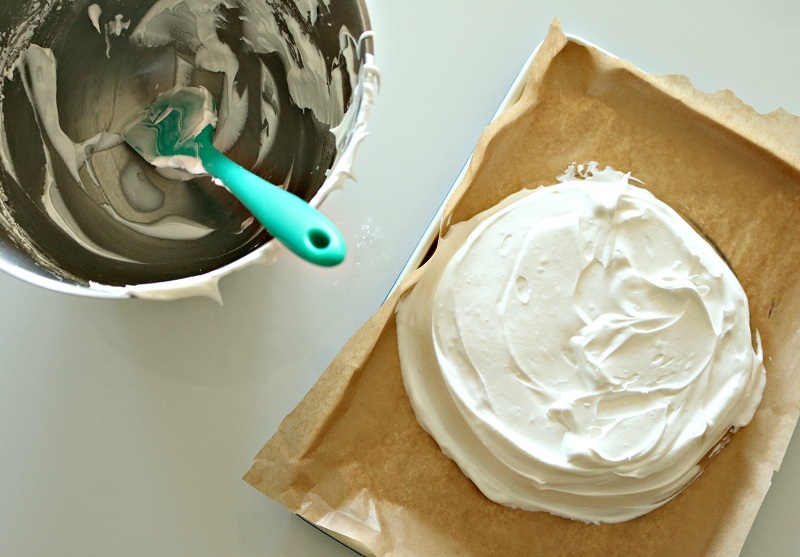 Use the whisk to dot blobs of egg white onto the baking sheet then lay the greaseproof paper flat on the sheet. Smooth it down to ensure it stays in place. Sift the cornflour into the egg whites & add the white wine vinegar: these are the ingredients which turn crispy meringue into marshmallowy pavlova. Fold together briefly until mixed. Spoon the pavlova mixture onto the baking sheet in the middle of the pre-drawn circle. Using a spatula, smooth the mixture to form a (rough) circle shape with a relatively flat surface. Place in the oven and immediately turn the heat down to 150C. Bake for 1hour 15mins. After which, turn the oven off and leave the door open. 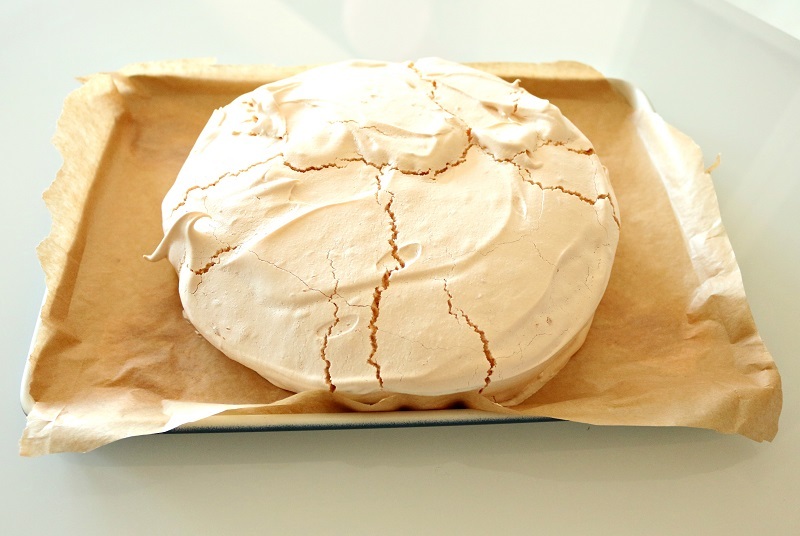 Once the pavlova base has cooled it will sink and crack a little. 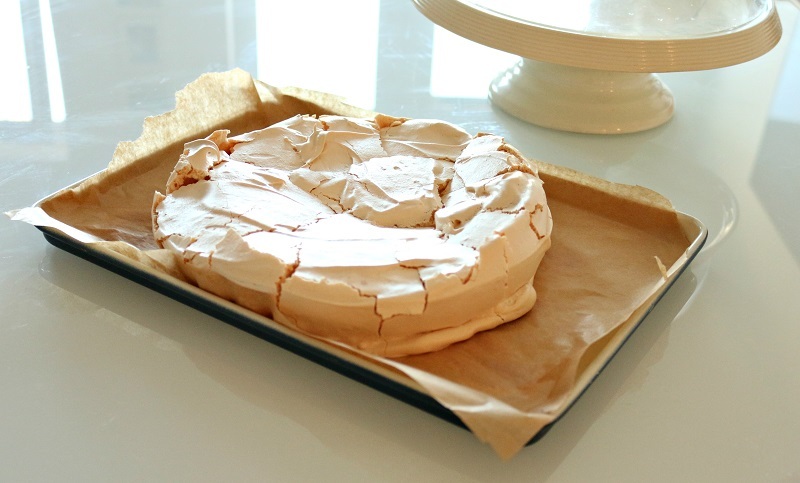 Turn the pavlova base upside down onto a cake stand or flat plate. Whip the cream until soft peaks form & add a little lime zest. 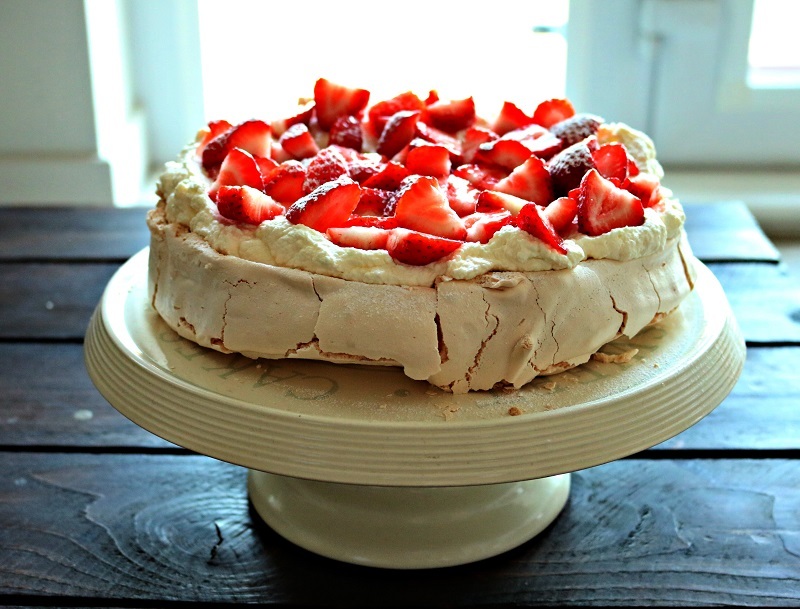 Spoon the whipped cream onto the pavlova base and scatter sliced strawberries on top. A final dusting of icing sugar and you’re ready to sink into a deck chair and enjoy with the sun on your face.